G Scale. LGB Lake George &Boulder Beer freight car. Condition is Used. # 4472. USA g Scale Trains 1762 WP Piggy Back Car. Condition is used. Small parts need to be repaired and reglued. The flat car needs deep cleaning. Piggy back car is in good shape. Everything in pictures are included along with the original box. Li ke n ew r an i nd oo rs o nl y. Controls switches and remote uncouplers! Operates electrically for remote operation. Condition is Used. Se e pi cs f or details. 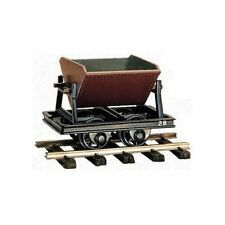 Marklin 58581 German Coal Car Kohlewagen Set. Coal Car 9-1/2" long. We use all new boxes and cushioning materials. Up for sale is a MTH Railking # 70-75029 Union Pacific 4-Bay Hopper Car in 1 Gauge (G Gauge). It is durable, attractive, and priced right! IF YOU CAN FIND THIS ITEM FOR LESS ANYWHERE SHOW US AND WE WILL BEAT THAT PRICE ! Marklin 58313 Kuhlwagen 1 Gauge G Scale Jaenisch Beer Box Car. Model:Marklin 58313 Kuhlwagen. Marklin Kulwagen Beer Box Car. We use all new boxes and cushioning materials. Original Box. Up for sale is a MTH Railking # 70-73007 Koppers UniBody Tank Car in 1 Gauge (G Gauge). Marklin Gauge 1 #58063 Nigrin Papa 1996 Museum Tank Car. Nigrin Papa 1996 Museum Tank Car. Model: #58063 Museumwagen 1996. We use all new boxes and cushioning materials. Original Box. THE LOG SKIDDER IS DISCONTINUED AND SOLD OUT AT BACHMANN A YEAR AGO. Fully compatible with all G SCALE OR LARGE SCALE TRAINS SUCH AS LGB, USA TRAINS, ARISTO-CRAFT, ETC..
Trending at C $88.85eBay determines this price through a machine-learned model of the product's sale prices within the last 90 days. Prior owner out one sticker on the side of the car. Box shows shelf wear. New ListingLGB # 44916 Wheaties Breakfast of Champions Box Car ,G Scale, Factory New. LGB High Quality item, LAST ONE ! Won't be produced again by LGB. The car was only removed from the factory sealed box for the pictures. NEW CONDITION WITH ORIGINAL BOX, BOX MAY SHOW SHELF WEAR DUE TO STORAGE. Used 20528 LGB Schweiger Set. This collectors set was produced in 1985. Gold nose loco verified to operate properly, serial number 751. Box is in good condition with a scuffs/ shelf wear per image. 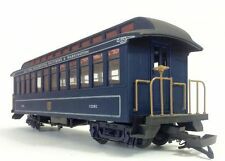 An LGB #1646 Denver & Rio Grande Western G Scale high-side gondola model. Contrary to the photo both cars have hook 'n loop couplers. Original box included. Wood-sided (plastic) LGB #1646. High Side Gondola. This car is very clean and has vibrant colors. Up for sale is a MTH Railking # 70-73013 Tank Train UniBody Tank Car in 1 Gauge (G Gauge). Ran indoors only, like new with the box. This is a G Scale boxcar with a festive "Happy Birthday" on the sides. It has an internal speaker that plays birthday sounds and also features sliding doors, plastic trucks, latch couplers, plastic wheels and metal axles. It requires a nine-volt battery for operation (not included). This item has been graded per TCA standards C-8: Like New. Overall condition is Like New. Manufacturer: LGB. Model Number: 4435 HB. Scale/Era: G Scale. Model Type: Freight Cars. Availability: Ships in 1 Business Day!. We carry the entire line of USA Trains. Detailed Archbar Trucks. 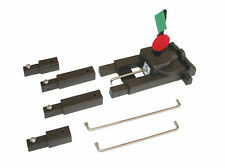 Both Hook/Loop and Knuckle Couplers Provided. Detailed Under Body. BODY ONLY WITH DETAIL PARTS ON IT. YOU CAN SPRAY IT BLACK AS SHOWN IN MINUTES. 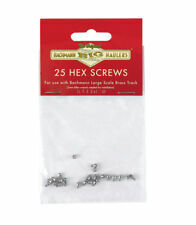 GREAT FOR SCRATCH BUILDING OR MAKE WORK CABOOSE ON A FLATCAR. Fully compatible with all G SCALE OR LARGE SCALE TRAINS SUCH AS LGB, USA TRAINS, ARISTO-CRAFT, ETC..
Marklin 85842 Museumswagen 1994. Model: #85842 Museumwagen 1994. Marklin Museum Wagon. We use all new boxes and cushioning materials. Original Box. Here is an LGB 94008 Exploding Dynamite Car. Add some excitement to your track with this exploding dynamite car.This car features a durable plastic body, plastic trucks, latch couplers, and plastic wheels and axles. This item has been graded per TCA standards C-8: Like New. Overall condition is Like New. Manufacturer: LGB. Model Number: 94008. Scale/Era: G Scale. Model Type: Operating Cars. Availability: Ships in 1 Business Day!. Here is an AMS G Scale Caboose #0501. Please see pictures for features of this caboose. This item has been graded per TCA standards C-7: Excellent. There are scratches and scuffs on the cabpoose. The overall appearance of this item may be improved with a gentle and thorough cleaning. Check the photos for a detailed look at this item. Overall condition is Excellent. Manufacturer: AMS. Scale/Era: G Scale. Model Type: Freight Cars. Availability: Ships in 1 Business Day!. 4067 Denver & Rio Grande Box Car. This is a good condition box car. There is no brake wheel. It is G-Gauge/Scale. Made in Western Germany! Trending at C $57.03eBay determines this price through a machine-learned model of the product's sale prices within the last 90 days. When building a model train scene, it's advisable to stick to a single scale because that ensures that the ratio between different objects looks appropriately realistic. G-scale items are noted for being large and hefty, so they can be used in either indoor or outdoor models. It's also considered to be a standard size, so it is easy to combine G-scale locomotives, railroad tracks, and cars from many different brands. What are G-scale model trains? The G in this model railway term got its name from the German word, "gross," which means big. In contemporary times, a lot of people also say the G comes from the phrase "garden scale" because G-scale products are so commonly used for garden railways. A G-scale train is any model train that will run on a G-gauge railway. This refers to a railway that has rails spaced 45-millimeters apart. What brands of G-scale trains and railroads are available? Since it is one of the standard scales, you can easily find G-scale products. The G-scale ratio is used by these common model train producers. LGB: LGB was the first company to create G-scale model trains. Bachmann: Bachmann is particularly notable for their themed G-scale sets, like ones featuring Thomas the Tank Engine. Aristocraft: Aristocraft's items are generally used in outdoor conditions. Lionel: Lionel's G-guage product line includes remote controls, whistles, and bell sounds. PIKO: PIKO creates weather-resistant models with a variety of G-scale trains, buildings, and tracks. USA Trains: Both the American and the Work Trains series made by USA Trains use the G scale. What accessories are there for model G-Scale trains? Tracks: Technically, the definition of G scale mostly refers to the railroad track itself. Any G-gauge track will have a gauge of 45 millimeters. Model locomotives: Trains that run on G gauge have scales of 1:22.5, 1:24, 1:29, or 1:32, generally. Train cars: You can find both passenger and freight cars in G-scale versions. Buildings:Stations, houses, depots, or other buildings can be included to make your garden railway look more realistic. You can find both modern and historical options. People: Figures for G-scale sets are slightly large so that they look proportional to the G-scale versions. Other accessories: Other G-scale-sized items like lights, gates, scenery, cars, or animals help to add to the realism of your scene.